1. Print out the free printable pattern and color it. 2. Cut craft sticks to fit on the page and glue them to the barbed wire fence. 3. To finish cut yarn for the mane and glue it to the picture. 1. 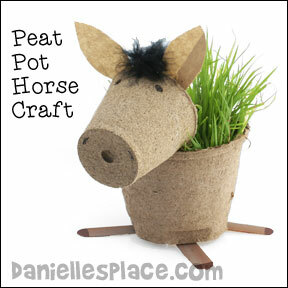 Glue the small peat pot on the bottom of the large peat pot to make the head. 2. 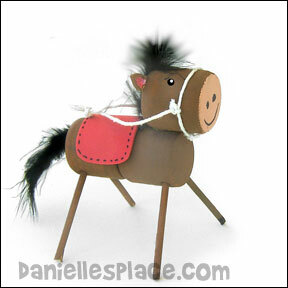 Cut two jumbo craft sticks in half and paint the halves to make the legs of the horse. When the paint is dry glue the sticks onto the large peat pot as shown in the picture to the right. 3. 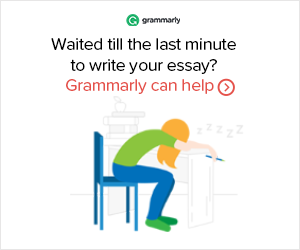 Cut the rope to the length you want for the tail. 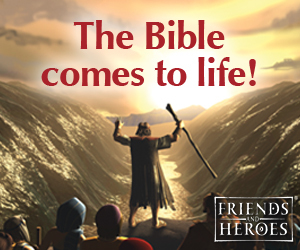 Separate the strands and use only one strange. Pull the fibers apart at one end. Glue the other end to the back of the large peat pot. 4. Cut ear shapes from craft foam or construction paper and glue them to the head. 5. Glue on eyes or draw them on. 6. To make the horse's mane cut pieces of yarn about 8" long and tie them together with another piece of yarn about 2" from one end. Glue the tied end to the top of the horse's head. Give the horse a "hair" cut so that some of the hair is different lengths. This will give the mane more fullness. 1. Cut a slit in the small peat pot about 1/2" from the rim and about 2 1/2" in length along the top of the peat pot. Insert the large peat pot in the slit to connect the two pots. 2. 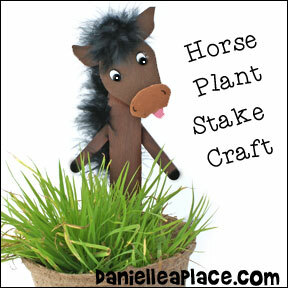 Cut two jumbo craft stick in half and paint the halves to make the legs of the horse. When the paint is dry glue the sticks onto the large peat pot as shown in the picture to the right. 4. Cut ears from craft foam or construction paper and glue them to the inside of the head. 6. 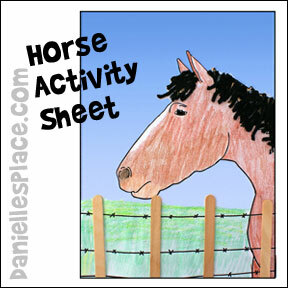 To make the horse's mane glue a small piece of feather boa or fake fur between the ears. 7. Fill the peat pot with potting soil and plant your seeds. 1. 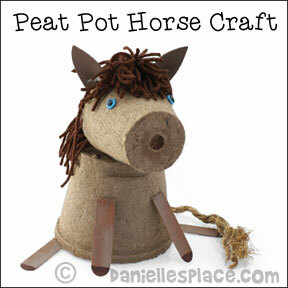 Cut the regular-sized craft stick in half to make the horse's legs. Paint all the craft sticks and let them dry. When they are dry glue them together as shown in the picture. 2. Cut the head shape, muzzle, tongue, and ears from craft foam, and glue them together. Then glue them to the top of the jumbo craft stick. 3. Glue a 6" piece of feather boa to the top of the head and to the back of the stake so that it shows on one side. 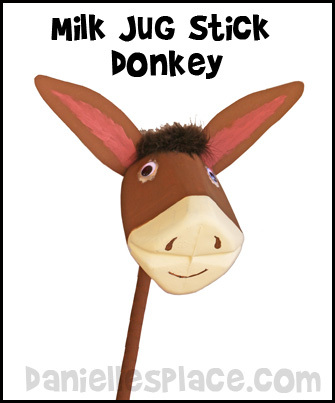 Young children will love playing with the stick horse or donkey, and it is so easy to make. If you don't have feathers or a feather boa, you can use rags ripped in strips or yarn. 1. Tear up newspaper into about 5" pieces. 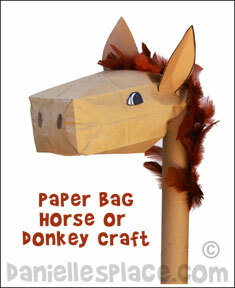 Wrinkle up the newspaper pieces and stuff them into the bag to make the horse's head. 2. Tape the bag head onto the end of a giftwrap tube by inserting the tube into the top of the bag a few inches and gathering the top edge of the bag around the tube. If you don't have a gift warp tube, roll eight to ten pieces of newspaper together starting at one corner and going to opposite corner so that you have two pointy ends on your roll. Stuff in the newspaper at the ends to make them straight, and tape the center of the tube with masking tape. Paint the tube to cover the newsprint. 3. Cut ears and eyes from construction paper and glue them to the head. 4. Glue feathers, feather boas, strips of rags or material, or yarn to the head and tube to make the mane. 1. Cut off one side of the top part of the milk jug where you screw on the lid so that the PVC pipe will fit into the side of the top. Use duck tape and low temp. glue to keep the PVC pipe in place. 2. Cut ears from brown craft foam and glue them to the jug. 3. Paint the entire thing brown including the PVC pipe and duck tape, except for the bottom of the jug and circles where the eyes will be attached. Paint these areas tan. 4. Cut a short length of feather boa and glue it between the ears. You can glue some more feather boa down the PVC pipe for the mane. 5. To finish glue on googly eyes. Filled with horse puzzles, brainteasers, word games, jokes riddles, and logic tests this is a great book for horse-loving children. My Very Favorite Art Book: I Love to Draw Horses! Young horse lovers can learn how to draw horses with the easy step by step drawing techniques employed in this book. 1. Print out the pattern and use it to assemble the donkey with hot melt glue. 2. Paint the legs and the body brown and let dry. 3. 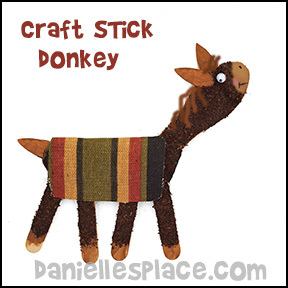 Cut short pieces of yarn and glue to the donkey's head and neck and add some for a tail. 4. Glue on the teardrop shaped ears and googly eyes. 5. Cover the donkey's body with Elmer's glue and sprinkle dry tea all over the donkey. 2. Cut dowels to make four pieces that are 2 1/2" for the legs. Use a pointy stick or large needle to poke holes in the marshmallows for the legs. Insert the dowels in the holes. 3. Cut ear shapes from fun foam and glue them to the head as shown. Cut a rounded square piece for the saddle. 4. Paint the horses body. Use a marker to draw on the face. 5. Tie a piece of string around the horse's face. Glue on the saddle. Flower With Red Jewel And Leaf Pendant Bracelet - Adjustable Leather Bracelet for children and adults. Enchantmints Wild and Free Music Box - 7" x 5" Jewelry music box with spinning horse that plays "In the Good Old Summertime". The Kingfisher Illustrated Horse and Pony Encyclopedia - A great resource for children of all ages, this book makes a great gift for horse lovers! A Comprehensive Visual Directory of the World's Horse Breeds - A perfect give for horse lovers of all ages. Includes horse breads from all over the world.